Mom, the Intern: Mom the Intern learns about fruit. Mom the Intern learns about fruit. Today, I was having myself a healthy snack -- a nectarine -- and a thought popped into my head. Boy, nectarines are sure similar to peaches. I wonder what makes them different? NECTARINES are just BALD PEACHES. That's right. That red fruit that grocery stores are marketing as something extra special are really just peaches with defective follicles! In fact, the article I found says, "There are no nectarine trees, only peach trees with a genetic mutation." Upon reading this, I was a little scandalized! 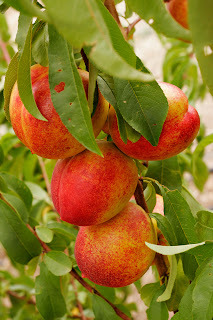 But, I continued to read on and discovered some more interesting facts about nectarines. Apparently, the fuzz found on peaches is what makes them softer to bite. Nectarines are harder and have a little zing to them because they have no hair. They also bruise more easily than peaches because the peach fuzz acts as a protectant. I wonder if this concept translates to human flesh? Also, some people think nectarines are a cross between a plum and a peach, since they have a similar skins. But NO. That is incorrect. If you've been thinking that all along, you've been misinformed. Change your way of thinking, pronto. Ok, so this might not be much of a revelation to most of you. It's probably common knowledge and most of you are going, "You didn't know that? What is WRONG with you?" And that's OK. Because you know what? I'm from Arizona, where fruit really doesn't grow. That's why I thought pineapple grew on a palm tree until just a few years ago, when Dill told me it's more like a bush (When I challenged this notion, he confirmed he'd been to the Dole plantation in Hawaii and saw it for himself. I was ashamed). Apparently, the public education system failed me. For those of you who were also shortchanged and never learned about nectarines (or even pineapples) ... now you know! Go spread the word. Ehhh... I disagree. They may be almost identical genetically, but the fuzz vs. no fuzz makes them fairly different in taste and even texture.